Photo of the day – When did he grow up? See that? 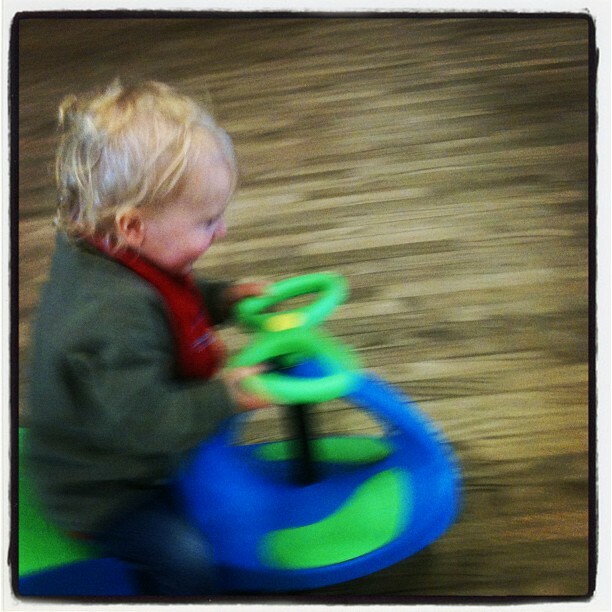 My little boy is flying along the gym floor on one of those plasma cars. It was hard with my iPhone to get a clear shot of him! He was steering it and avoiding obstacles and other kids that were running around like whirling dervishes. For most adults without kids, this seems like no big feat. But only 4 months ago, my wife and I got married in the same hall as he is playing in now. He couldn’t walk yet, and crawled around. He was still so much a little baby. Only 4 months later, he has morphed into a toddler! When did that happen? I don’t have kids..but its true, that feeling that if you blink you are going to miss on a lot of things is something I feel too! Not related to kids though, but..don’t you find time flying by really fast? It’s like its not only deadlines that are making that whooshing sound! I remember being informed that time speeds up for us as we age. Something about a year being 1/10 of our life at 10, but only 1/50 at 50. In other words a day is shorter relative to our age as we get older. Previous PostPrevious Google+ adds Pages for businesses and brands to the fold! Yes! Next PostNext Photo of the day – Children’s Bible Stories. WTF!